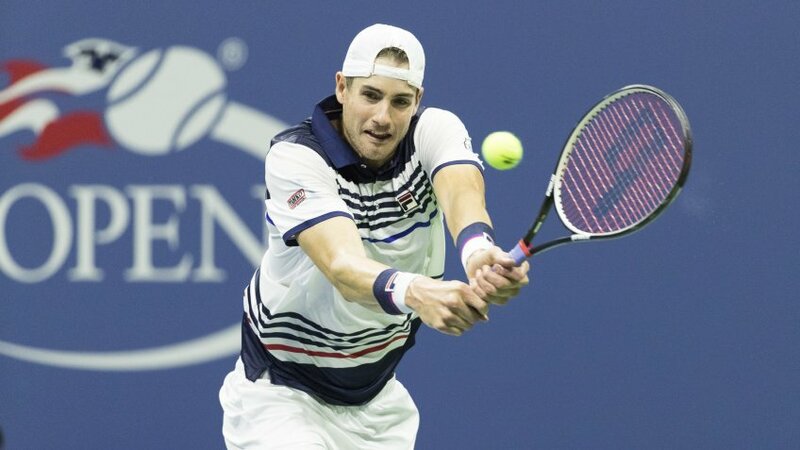 John Isner added his name to the history books of tennis as the man who defeated Nicolas Mahut in the longest professional tennis match in history. At the 2010 Wimbledon Championships, he and Mahut went on for three days in a game that generally lasted for 11 hours and 5 minutes. The American professional tennis player moved from obscurity to stardom through intense hard work and consistent practice which have taken him to the finals of major events in the game. He holds 14 singles career titles and 5 doubles title. Born to his American parents Karen and Robert Isner on the 26th of April 1985, at Greensboro, North Carolina; he was named John Robert Isner and brought up in Tampa, Florida with his two elder brothers – Jordan and Nathan Isner. His father Robert or Bob as he is sometimes called is into building constructions while his mother Karen is a Real Estate Agent. John had his high school education at a public school called Walter Hines Page High School and his college days was spent at the University of Georgia where he obtained a degree in speech communication. John Isner’s first contact with tennis was at the age of 9 before he proceeded to Saddlebrook Academy to fine-tune his skills. He began competing in the game at the age of 11 in his hometown and carried on till his college years. He made an appearance at the National Colligate Athlete Association championship in 2007, smashing through to the singles finals and winning the team titles of the NCAA championship. With the fire burning in his veins after his graduation from the school, he proceeded to his first international game in 2007 and established himself as a professional. He then entered for the USA F14 Futures and the Lexington Challenge, his game improved tremendously and so did his rating. By 2009, John Isner triumphed over highly rated players like Gaël Monfils, Marat Safin, Jo-Wilfried Tsonga and others in major games. For that, he received the ATP Most Improved Player of the year as his ranking climbed. Since then, he has been able to pull off several amazing records. Apart from his accomplishments at 2010 Wimbledon, he made another record with Kevin Anderson in 2018 which saw the longest Grand Slam semifinals ever played. The game lasted for 6 hours, 32 minutes. John can boast of 3 single titles of the Hall of Fame Championship and 5 Atlanta Open single titles. Even though we can all tell that John Isner has not fared badly financially, the total value of his wealth is not known. This is obvious when you consider the various figures quoted as his net worth. While his riches has been estimated at a mere $4 million, it has also been roughly calculated at over $30 million by some sources. Whatever the true value of his wealth is, he accumulated it from his various endorsement deals and career earnings. As of this writing, his prize money totals US$16,291,981. 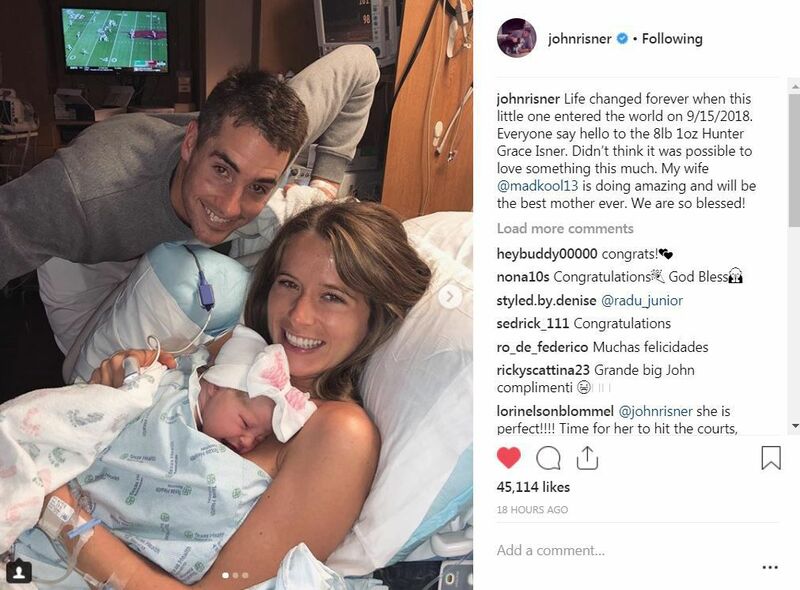 Wife or Girlfriend, Is John Isner Married? John Isner happens to be a one-woman man, he only dated and married his girlfriend of 5 years, Madison McKinley. There are no other records of any past girlfriend anywhere neither are there any rumors of affairs he may have indulged in. The ace player started dating the American model and fashion designer after they met at Justin Gimelstob Children’s foundation in 2011. He proposed to her in June 2017 and 6 months later, the duo went on to tie the knot. They welcomed their bundle of joy Hunter Grace on September 15, 2018. Madison McKinley went to the Parsons School of Design in New York for 3 years before she finished up her schooling in the University of Texas, bagging a degree in Fine Arts. She and her mother Karla McKinley co-founded a handmade jewelry line in 2017 and her family owns a Ranch (Off Steer Head Ranch) located within the Horn Mountain axis in Wyoming where she occasionally spends time. He is one of the hunky athletes on the court with a towering height of 6 ft 10 inches (2.08 M), complemented by a weight of 111 kilograms (244.7 lb).